UPDATE February 14, 2015: The Bill failed to pass in December and is in “Session Sine Die” or adjourned for an indefinite period. A new bill currently making its way through the General Assembly could make it a lot easier for the Bolingbrook Police Pension Board to take away the pension of convicted murderer, Drew Peterson. Proposed Illinois House Bill 5816 would let pension boards consider some new criteria with regards to dispersal of pension benefits. The bill which was introduced last month would let boards consider official misconduct and felony convictions grounds for forfeiture. “It says if you have been convicted or pleaded guilty to corruption charges, then the board can withhold your pension,” said 41st District Rep. Darlene Senger, R-Naperville, the bill’s sponsor. ..if a member or participant of a pension fund or retirement system established under the Code is receiving an annuity or pension from a pension fund or retirement system established under the Code and is convicted of, or pleads guilty to, a felony…then the board of trustees of that fund or system shall suspend the payment of that annuity or pension during that individual’s incarceration for that offense. In Peterson’s case, that would be 38 years. The Naperville Sun reports that Senger’s motivation for the bill arose from the current Drew Peterson situation. The Bolingbrook board voted last week to hold hearings to decide whether they should put an end to Peterson’s benefits, something that may be difficult to do under current law which is protective of civil employees. There is another part to the proposed legislation, however, that could allow Peterson to continue collecting his annual $79k payout. It would allow pension boards leeway when the beneficiary of the pension is a child. That part of the bill has not yet gone to a vote. Currently, Peterson’s adult son, Stephen, is receiving his father’s pension benefits and has custodial care of his father’s two minor children. Their mother is Stacy Peterson who has been missing since October 2007. Drew Peterson is the only named suspect in connection to her disappearance and Stephen lost his job when he failed to tell his superiors about accepting guns and money from his father immediately after Stacy went missing. Peterson’s attorneys have filed an appeal of his murder conviction and it is expected to be argued in appellate court some time in the Fall of this year. Also, in “this is starting to feel like a prolonged case of déjà vu” news, the Illinois Supreme Court has denied Stephen Peterson’s request to appeal the Appellate Court decision that upheld the Village of Oak Brook’s decision to terminate him from his position with the Police Department. 117194 Stephen Peterson, petitioner, v. Village of Oak Brook, etc., et al., respondents. Leave to appeal, Appellate Court, Second District. Today in court Joel Brodsky turned over some of the documents requested by his former co-counsel. Drew Peterson’s current defense team filed a motion for a new trial based partly on claims that Joel Brodsky provided their client with an ineffective assistance of counsel and that his desire for money and fame created a conflict of interest in the defense of Drew Peterson who was convicted of murder and awaits sentencing. Last week they asked for documentation of Joel Brodsky’s financial arrangements with Drew Peterson. However, Drew Peterson, seemingly giving up all allegiance to his one-time friend and lawyer, signed a letter clearing the way for Brodsky to produce the requested documentation. Another status hearing date is set for next Wednesday. Today in court Joel Brodsky filed a motion to “quash” a “subpoena duces tecum”. Such a subpoena is a writ issued by a court at the request of one of the parties to a suit; it requires a witness to bring to court or to a deposition any relevant documents under the witness’ control. Apparently, Mr. Brodsky does not want to hand over his documents concerning his financial arrangements with his former client, Drew Peterson. If his motion is successful he could be allowed to merely bring his records to court with him when he appears (rather than hand them over to the prosecution), or his former co-counsel could be asked to obtain the information that they need by some different means. A claim of ineffective assistance of counsel has been made in a motion filed against Joel Brodsky by Drew Peterson’s attorney, Steve Greenberg. 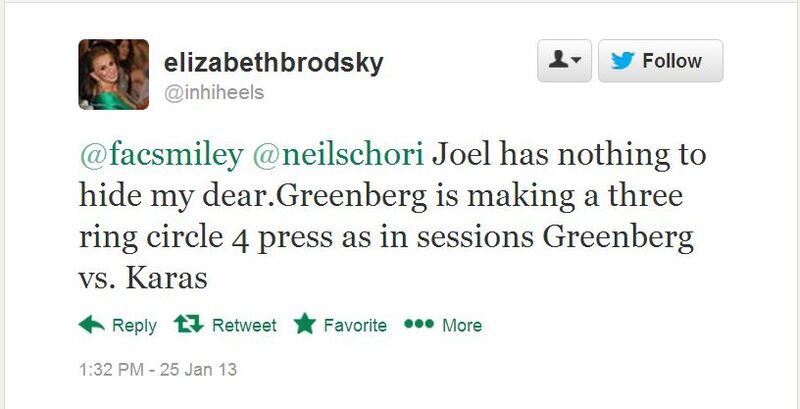 Greenberg claims that Brodsky misrepresented his experience to Mr. Peterson, that his desire for publicity was a conflict of interest in his representation of his client and that he made a legal error when he called to the stand a witness who put Drew Peterson at the scene of Kathleen Savio’s death. J.P. Morgan Chase was also subpoenaed for records. The next status hearing is scheduled for February first. Attorneys in the Drew Peterson case are scheduled to be in court at 9:30 a.m. on Thursday, January 10, 2013 before Judge Edward Burmila in Courtroom 403. The attorneys will ask Judge Burmila to schedule a date for a hearing to argue post-trial motions. Beyond setting that court date, no other legal issues are scheduled to be argued on Thursday. UPDATE 1/10/12: The state has filed a response to the defense’s post-verdict motion for a new trial based on, among other things, claims of ineffective assistance by attorney Joel Brodsky. A hearing for motions is set for February 19. A sentencing hearing and the sentencing will come after that (barring the event of an actual new trial). Peterson’s former attorney, Joel Brodsky, may need to take the stand to defend himself while Steven Greenberg and Joe Lopez may be called as witnesses. Legal experts have stated that they doubt a bid for a new trial will be successful. Drew Peterson’s former wife, Vicki Connolly, and his eldest son, Eric Peterson have been subpoenaed by the state to testify at the sentencing hearing. The both have previously testified before the grand jury and at a pre-trial hearing. Kathleen Savio’s sister, Sue Savio, says that she has her victim impact statement ready to be read. Drew Peterson was back in court this morning for motions to overturn his conviction and get a new trial. Attorneys Steve Greenberg and David Peilet will file a motion claiming ineffective assistance of counsel by Peterson’s long-time lead attorney, Joel Brodsky, who withdrew from his defense last month. Judge Edward Burmila is giving the defense until December 14 to file their pre-sentencing motions and the state will have until January 9 to file its responses to those motions. This pushes Drew Peterson’s sentencing date further into 2013, but no date has been decided upon yet. Last month Attorneys John Carroll and Michelle Gonzalez also filed a motion requesting a new trial based on claims of ineffective assistance of counsel by Joel Brodsky. Drew Peterson told Judge Burmilla in open court that he did not authorize the motion so it was denied. During Drew Peterson’s trial for murder his defense team never seemed to turn down a chance to be heard and seen in the media, but the prosecution was keeping a low profile. Finally, lead prosecutor, James Glasgow, can speak out about the case, the hearsay, the trial, the defense team, and Drew Peterson; and boy does he have his say! You need to listen to this interview he did yesterday on WLS’s Roe and Roeper show. ROE: I think there’s been a lot of misunderstanding in the last couple of days. You explained it, I think, very well in your press conference yesterday and we’ve had a lot of people calling in with concerns about that so let’s jump into that for a second. The hearsay law is not as simple as “well now anyone can just say anything about anybody and go to court and get a conviction on somebody that they don’t like because they heard some conversation” right? ROE: Hold on. Let me back up a little. Let’s take that out of legalese. So what, basically the law that you guys drafted–and there are some other laws around the country that are similar to this–but the law that you drafted specifically said that if you kill somebody to silence them because they were going to testify against you for another crime, that hearsay evidence surrounding that individual who is now dead can be entered into court, but before you do that a judge has to sign off on this. A judge has to sign off, based on the preponderance of evidence, in kind of a mini-trial in advance. GLASGOW: Yes. And these statements have to be relevant and probative to the issue at hand. They’re not just any statement, Roe. If someone is murdered in a bathroom and it’s made to look like an accident and they happen to have been told by the murderer, “I could kill you and make it look like an accident” that’s pretty relevant and pretty probative. ROEPER: Jim, what about the criticism, and I agree, as Roe said, it’s been widely misunderstood and sometimes misreported but some of the defense attorneys were saying yesterday that it’s so specific that it was written for one case. GLASGOW: Those guys don’t tell the truth about anything, now do they? In Giles v California, which was recently decided by the Supreme Court a couple of years ago–and I actually flew out and watched the argument–Antonin Scalia , who is a very conservative justice and who is a champion of cross-examination and confrontation, found that 400 years ago the concept of forfeiture by wrongdoing was in place in the common law. It was there when the drafters of the constitution wrote the constitution. That’s one of his tests to determine whether or not he’s going to go along with something in the common law. But anyway, the federal government, in 1997, enacted a law that was section 804(b) now adopted in Illinois, January first, 2011, which is basically forfeiture by wrongdoing and it’s “equitable forfeiture”. If you deliberately destroy evidence by getting this witness out of the way, you can’t come in, thumb your nose at the judge, laugh and say, “Ha,ha you can’t get me now!” That’s basically the concept.